San Diego has the perfect climate for alfresco living. Long summer evenings and mild winter days mean we can enjoy the outdoors year-round. So why not live it to the max? The California Room is one of the largest growing elements in new home construction, and owners of existing homes are re imagining their yards to include them. What is a California Room? It’s an outdoor space that has protection from the elements. It has a roof to keep out rain and sun, but it’s open on one or more sides. More than a patio, it is furnished with all of the luxury of interior spaces: sofas and chairs, tables, rugs, fans and light fixtures. Some homeowners even add a bar, TV, and fireplace. It functions like an extra room in the house, a space where people can gather for special occasions, socialize, or just relax in the evenings after a hectic day. When creating a California Room, the key is to treat it like an indoor space. Here are a few tips to get started…..
Just like any room in your house, think about how you want to use it. Consider the pieces of furniture that you would like to use, their sizes, and how they will be configured. A scaled model will help you see how much space you will need. Plan for adequate clearances and traffic flow. Do you have a great view? Want to catch the sunset? Or maybe cuddle up in front of a fire and watch a movie in the evening? The space should invite people outdoors and encourage them to linger. Expansive openings blur the boundaries between outside and inside, allowing for full, open views and breezes. Many door and window manufacturers offer sliding, stacking, and folding glass doors that can span whole walls. This doubles the living spaces and allows light to flow inside all year long. If possible, level out the floor of the California Room to the height of the adjacent indoor room. Maintaining consistency in flooring/finishes, color scheme, materials etc. creates a smooth transition and the illusion of one large open-plan space. 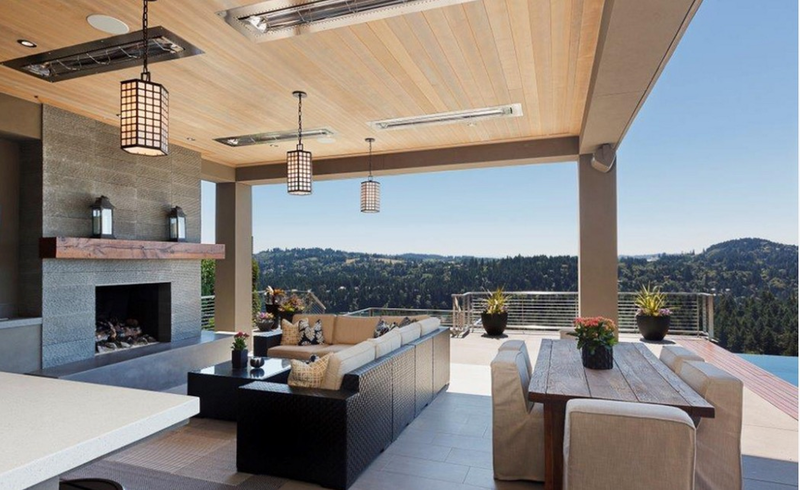 Thanks to advances in materials such as all-weather finishes and fabrics, outdoor lighting and indoor-outdoor rugs, you can live as stylishly and luxuriously outdoors as you do indoors. Test drive sofas for lounging…. this is a place to splurge on quality and comfort. Great lighting (on a dimmer) is a must. Accessories add personality and the finishing touch. A great design for a California Room is an excellent way to add value to your home, but more than that, it’s the perfect space for relaxing, entertaining and enjoying the SoCal lifestyle, year-round. FDK Design receives San Diego Home and Garden Magazine's "Baths of the Year 2018" Honorable Mention! FDK Design is announced as one of "Best Of Houzz 2017" winners.